This artist's concept shows the test vehicle for NASA's Low-Density Supersonic Decelerator (LDSD), designed to test landing technologies for future Mars missions. A balloon will lift the vehicle to high altitudes, where a rocket will take it even higher, to the top of the stratosphere, at several times the speed of sound. Bad weather has delayed the first test flight of NASA's new "flying saucer" yet again, pushing the liftoff back to Wednesday (June 11) at the earliest. NASA had originally planned to launch its Low-Density Supersonic Decelerator (LDSD) test vehicle via balloon on June 3 from the U.S. Navy's Pacific Missile Range Facility on the Hawaiian island of Kauai. But uncooperative winds have caused multiple delays, pushing the launch to June 5, June 7, June 9 and now June 11. "Wind conditions have been the prevailing factor in the launch delays, as they have to be just the right speed and direction in order to launch the balloon that carries the LDSD test vehicle," NASA officials wrote in an update Sunday (June 8). "The launch decision for Wednesday, June 11 will be made on Tuesday, June 10." The LDSD program is developing and testing gear that will slow the descent of heavy payloads, such as human habitat modules, through the thin Martian atmosphere. Such technologies will be necessary if humanity ever wants to set up an outpost on the Red Planet, NASA officials have said. 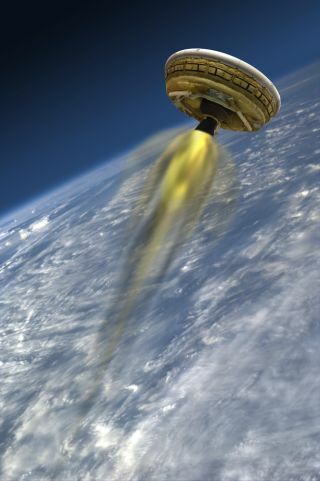 The LDSD test vehicle is outfitted with a 100-foot-wide (30.5 meters) parachute and a saucer-like device called a Supersonic Inflatable Aerodynamic Decelerator (SIAD). The SIAD, which measures 20 feet (6 m) across, is designed to fit around the rim of an atmospheric entry vehicle, increasing its surface area and thus its drag. During the test flight, an enormous balloon will loft the LDSD vehicle from the missile facility, taking it up to an altitude of 23 miles (37 kilometers). The vehicle will then detach and fire its onboard rocket motor, which will blast the craft up to 34 miles (55 km) and a speed of Mach 4 (four times the speed of sound). If all goes according to plan, the parachute will then deploy, slowing the test vehicle down to Mach 2.5. Then the SIAD will inflate, paving the way for a soft ocean splashdown. The stratospheric flight test will give NASA its first look at how the LDSD tech performs at high speeds in Mars-like conditions, project officials have said. The space agency will webcast the test live; you can follow along here on Space.com. Liftoff is currently scheduled for 2 pm EDT Wednesday (8 a.m. local Hawaiian time).